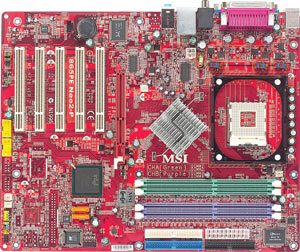 My new mobo is the MSI 865PE Neo2-PLS. I bought it from a lowyat.net forumer for RM80 including delivery. Not bad for a 865PE board. But there are few problem with the board, and one of it is the some of the capasitors are bulged. Hopefully it won’t explode before I change to new PC. ^^;;. So far, the mobo don’t give me any major problem. The only problem is that I need to format my old OS because I can’t fix it using the Vista disc. >_< Took me few days to get all the thing working. And this mobo don’t have compability problem with my graphic card. Unlike my old mobo, the Asus P4S8X-X which have compability problem with my Geforce 6600 AGP. Can’t play any 3D games due to this problem. And overclocking using this mobo is better than my Asus. Coz my Asus cant lock the AGP/PCI bus, which coz me problem when I increase my FSB. But I still cant overclock very high with this MSI mobo. If I want to reach 2.8GHZ, I need to set my vcore to at least 1.6v to get it running. Scare that this will burn my mobo. I also bought a thermal paste/grease for the CPU and GPU. The one that I bought is the Tuniq TX-2. I heard that the performance is quite good and the price is cheap too. RM19 from ModernoPC. But took me quite some time to get it as the seller put the wrong address in the parcel. ._. This entry was posted in My Life and tagged 6600, 865PE Neo2-PLS, asus, geforce, intel, motherboard, msi, p4s8x-x, tuniq, tx-2, vista on July 5, 2008 by Khim Hoe.